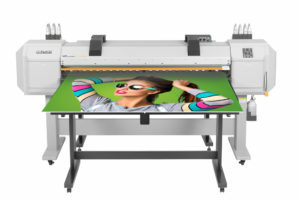 The VJ 1627MH is the newest member to join Mutoh’s ValueJet wide format digital printer family. The ValueJet 1627MH is a 64in (1625 mm) wide hybrid printer featuring a hot air knife media drying system and unique resin-based inks enabling direct printing on both rigid and roll substrates. Prints are dry when they come off the printer. The ValueJet 1627MH incorporates a high end piezo drop-on-demand print head capable of producing print resolutions up to 720 x 1440 dpi, making it suited for top quality output for short viewing distances. The ValueJet 1627MH comes with a brand new CMYK + White resin-based ink set called MP-31. All inks come in 500 ml packs. MP stands for multi-purpose, which refers to the unique capabilities of the inks and their extreme versatility. The inks allow direct printing on white, transparent and coloured rigid substrates, including foam board, cardboard, alu panel; even on acrylic sheets as well as rigid sheets for thermo forming (PVC, PS, PP, APET, PLA). Printing on white, coloured and transparent roll substrates is also possible, including heat sensitive media, shrink film, recyclable non PVC media, etc. Mutoh’s MP-31 series inks have a UV durability up to two years outdoors without lamination. The MP-31 inks are also extremely stretchable and shrinkable, making them equally suited for high stretch applications such as car wrapping as well as thermo/vacuum forming and shrink applications. The new Mutoh ValueJet 1627MH is equally suited for sign and display print shops for the production of both indoor and long term outdoor prints, as well as for graphics companies looking for a digital solution for proofing or short run production of packaging prototypes or customised labels, even for industrial printers specialised in thermo forming. For rigid printing, the printer can be equipped with foldable rigid print tables. It handles rigid substrates with a thickness of maximum 16mm and a weight of maximum 15kg. An optional media alignment system can be mounted to easily align rigid media at the front side, which allows perfect double sided printing. The 1627MH can also be used with customised jigs for printing on all kinds of pre-cut blanks. For roll prints, the five colour 1627MH can be equipped with a 30kg automated take-up system to roll up finished prints. Switching between rigid and roll setup is fast. Compared to its predecessor, the ValueJet 1617H, the new VJ-1627MH delivers a performance increase of up to 20%. In CMYK setup, print speeds up to 12 m² per hour at 720 x 720 dpi are possible. Mutoh also optimised user convenience by improving the user interface, by implementing semi-automated cleaning cycles as well as automated media height measurement, ensuring perfect output thanks to an identical gap between the print head and the substrate, regardless of the substrate thickness. Regular maintenance features have also been improved. The machine is equipped with left and right maintenance covers. The operator can moreover also replace the print head cleaning wiper by himself.